1. The sweater knitting continues around here, and I sincerely hope I am not about to jinx myself by saying such a thing out loud, but things might be well on track. I’m a couple of inches away from finishing the final piece of the cabled orange thing (which, yes indeed, I’ll be sure to share with you once the pattern is written up! ), and my Ravine pullover now has two full sleeves and likely a good start on the back piece before the evening is over. The cardigan needs finishing and a collar and button-band still, but I’m choosing to believe that this part will be not much to worry about. (Probably.) In any case, they’re still super nice to look at while they’re in progress. Wool and cables are great. 2. The other day last week when I was in Toronto I had lunch with fellow knitter/teacher/designer Robin Hunter, and she commented on all the sweater chatter I’d been doing and the fact that, based on our bust sizes (which are only 1 inch different), we would be assumed to be choosing the same pattern size if we were making the same sweater. Now, would you guess from this photo of us that this is the case? My guess is, probably not – and you’d be right! One or both of us would be modifying the heck out of the pattern to get it to what we want. Our cross-shoulder width measurement and sleeve and body length measurements would all be entirely different. It just goes to show – know your measurements and be groovy with modifying, and you’re more likely to get better results. 3. Finally, I have the pleasure of showing off a picture of the lovely cabled pillow pattern I have in the November 2012 (on newsstands now) issue of Canadian Living magazine. (I think you have to get the cat separately. The instructions are only for the pillow.) It’s a print magazine and they are generously giving copies to three lucky winners! So, if you’d like to win a copy of this issue, please leave a comment on this post, with your favourite thing about knitting cables. With that, I bid you a happy weekend and good fall knitting ahead! I’ll catch you next week with, hopefully, more sweater knitting behind me. Cables were the first thing I learned and are probably my most favourite thing to knit. Once you know the trick, they are “easy as pie”… and believe me, I LOVE pie. I love the TEXTURE and I have always had a love affair with what I’ve always called fisherman knit sweaters. The more cables the better. It was the very first thing I knitted for my hubby (at the time, boyfriend, as I had not heard of the sweater curse) and one sleeve came out longer than the other but he wore it for years anyway. What a sweetie!! Gosh, those sweaters are looking gorgeous. Love the fall colors, and I’m all about cables these days. Oops… I should add that my favorite thing about knitting cables is all the texture. Such a classic look! i love that they look more complicated then they really are to knit. I love that with a simple pass of stitches the items transforms into beautiful patterns. Really can’t wait to see that red/orange sweater. It looks stunning! My favorite thing about cables is two-fold: 1) it seems to make the piece go by pretty quickly and 2) I don’t get how they work so every time the cross-over happens I’m delighted. Those sweaters look lovely as is! Can’t wait to see what the orange one looks like all knitted up. As for cables… I love the way that they form as you go along. It’s like a little surprise as they grow with each row. Even if you know what they’re supposed to look like, and even when you’re following a chart and know what you’re doing, for me it’s still a little bit of a thrill to see everything actually working out as you knit it. My favorite thing about knitting cables is how they take advantage of the fact that in knitting all the stitches for a row are held on the needle ready to go, allowing you to bypass stitches and then come back while staying on the same row. It was this near-magical bit of cleverness that made this crocheter take up knitting in the first place! I love knitting cables because they are deceptively easy but the final product makes me feel like an engineer. 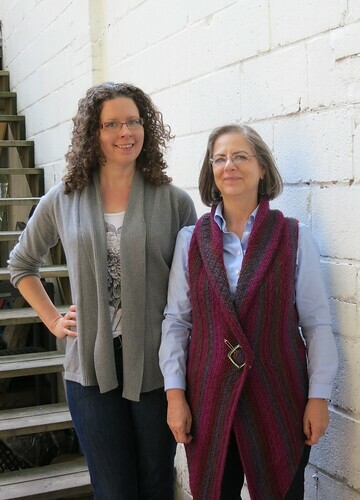 I did my first cabled sweater vest at age 12 and from then on I was hooked on cables. I am now 49 and just keep getting more and more intricate with cables as I look for a challenge. Love this Pillow!! I love knitting cables because of how elegant even a simple one looks and how it can zest up little knits. The more cable patterns in a design the better I like it. Keeps the project interesting to knit on. My favorite thing About knitting cables is that they look complicated but are so easy to do! I haven’t tried them yet but cables look so inspiring! I hope they’re as easy as everyone says. I haven’t tried it yet, but would love to learn! My favorite thing about cables is watching them emerge as you work. Oh, I’d love to have that magazine, even though I am not Canadian… hope that’s okay? But to name one thing about cables that I like? Now that’s a tough question… what’s not to like? I love how they look, the intriguing textural paths they create, even the action of twisting and crossing… what fun! Those cables are beautiful and since I have no access here in the States to Canadian Liing I would love to receive a copy! Best wishes with your sweaters……I’ll be at Rhinebeck next week and will keep a look out for your gorgeous cabled one! I don’t know if there’s any way to put my love for cables into words! The texture, the geometry, it’s everything about them. I love cables! They impress almost everyone. Cables look hard to muggles and can still impress knitters. Besides, cables are just glorious. Cables are wonderful! Love the colors of your sweaters. i love canadian living and i love your pillow design partly because i love cables. so sign me up to win a copy! My new have thing about cabling is doing it without cable needles!! Thanks for the instructions! What a lovely pillow! The cables give such a sculptural elegance to the finished piece. I love how they can be used in SO many different ways, yet you only have to learn one technique! I am no designer, but the creativity in using them to create patterns always impresses me. I can’t wait to see your orange sweater! I love the texture and depth that they give knitted fabric. I think I may have to look into getting a subscription to Canadian Living. I live in Tennessee so I read Southern Living every month but I think I can safely say that they have never included anything about knitting in any issue ever! I love knitting cables because they look so much more difficult than they are. It makes me look more talented than I am. One of my favourite sweaters was one that my Mom knit with cables and bobbles and twists (oh my!). I remember I was taking skating lessons at the time and she thought that I would need a warm sweater (and matching toque). I wore that sweater out! I’m with the others in that I love the texture! They give interest to what could otherwise be a very boring article. And I agree with Jeanie, they are much easier than they appear, but non-knitters don’t know that, so you do look like a super-star knitter. Knitters are a devious bunch, aren’t they? My favorite thing about cables is that a simple re-arrangement of stitches creates totally different appearances with perfect ease. My goal is to make a cabled sweater but alas, the sweater quantity of yarn eludes me in my yarn diet. My favorite thing about cables is that you end up with a fabric that weaves around itself in clever ways. That something you can’t do unless you’ve knit the fabric yourself, and it’s like you and the knitting have a secret the average sweater-wearer won’t guess. Honestly? The only thing I like knitting cables is the look of them. I especially love the big, chunky woven cable textures. The thing I like about knitting cables is knitting them without a cable needle! And that they’re made by stitches taking “cuts” in line. Out of order! I love knitting cables because it confounds the average person (non-knitter). “Really? you MADE that?”. If only they knew. Knitting cables? Only have been successful with it one time. Guess this pillow project would be a great time to try again. I’d love this magazine. Wonder if I can get it in the US? I love the texture of cables! They’re simple, but add interest to a piece. What sweater pattern are you wearing in that photo? It’s gorgeous! Cables add just the right amount of spice to any pattern. Your pattern is gorgeous!!! I am new to cable knitting and am trying a hat and am loving it. I can see how addictive this can and will be. Oh, my favorite thing about knitting cables is the magic that appears from such a simple process! I just think cables are gorgeous and they make me swoon! I love the variety of cables you can do and also how flattering they can make a sweater. I think cables are incredibly satisfying. They’re really such a simple thing, once you get the hang of them, but they have such Punch. I have not tried cables…yet…anxcious to try. I love Canadian Living Mag. and can never find it to buy. i can’t wait to see your finished sweaters modeled by you, glenna! i would love to win the cabled pillow pattern(magazine)! i am working on Christmas ideas…that would be perfect! thanks for the opportunity! I love looking at your sweater pictures. The colors are just gorgeous! Cables are lovely but I have yet to try them. I’m slowly expanding my skill set but haven’t reached cables yet! My favourite thing about knitting cables is that people think they are hard to do but they are in fact very easy! Beautiful pillow. Thank you so much for the opportunity to win the Canadian Living magazine! I love that pillow! And Celtic knots have always interested me. What a cool book! I love the grace that cables impart to any project. They are one of my favorite things to knit….interesting, challenging, graceful. I especially loved it when I learned to do a cable without a cable needle….so much faster (unless the yarn is especially thick or it’s a 4×4 or larger cable). Love Cables. Don’t knit enough of them. Must remedy that. I love cables because people look at the finished projects and think you’re a genius. The hard part is not telling them how easy it is to do. I am planning to knit and felt pillow covers for our living room couch. A beautifully cabled pillow cover added to the mix would create texture and interest. i would be thrilled to win a copy of the magazine containing your beautiful pattern! I have always feared knitting cables since they look so complicated and was happy to read so many posts that comment about how easy they are to do! I love knitting cables because they look so much harder than they are, so other people find them very impressive! Happy I love YARN Day to you! My favorite thing about knitting cables is that it’s one more challenge I’ve yet to tackle. I’m thinking I should start small. The pillow would be a perfect sized first project. Wool + cables = Comfort. Like others have mentioned, once you get the hang of cables they are much easier to knit then they look. My favorite thing about cables is how cables require enough attention to clear my mind of anything but my knitting but easy enough to be relaxing! I love knitting cables without a cable needle and scaring the uninitiated. It’s such a satisfying task, figuring out where the yarn and the needles and stitches all go! I love that they are classic and that you can look down at the repeat to figure out your pattern rather than use a chart. Beautiful pillow. Cables have always appealed to me. When knitting them, you get almost instant gratification of seeing such a beautiful, classic pattern. Gorgeous pillow and I love the cable pattern, it’s a favorite! I haven’t knit cables in years but I love that pillow design! Lovely! I knit a lot of things with stockinette stitch so I love the challenge of cables to break up the monotony. I’m thinking Christmas with this pattern! The pattern is a beauty. Cables feel warm and cozy with strength all at the same time. I love cables for their appearance. Doesn’t hurt that non-knitters are impressed by them! Wool and cables really are the best combination, if you ask me! I’m working on a cabled test knit for babycocktails in some wonderful woolly wool (it’s even local to Wisconsin!) and I couldn’t be happier. I love knitting cables because it keeps a pattern interesting. You just follow the instruction chart and like magic…cables appear! 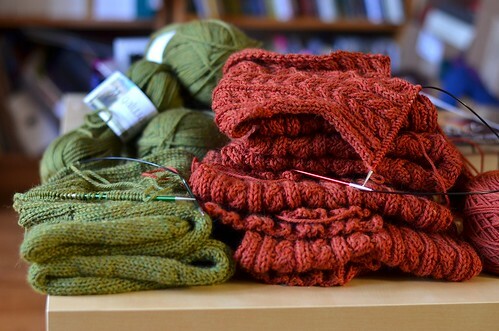 Nothing is more satisfying than seeing someone’s ALMOST finished sweater photo. Seriously, especially with the colors that photo makes me drool a little….and want to pick up the needles again on my own WIP sweater! Hmm…favorite thing about knitting cables has got to be the return. By that I mean that (for me) cables heavily slow down the progress of the sweater, and yet in the end the cables make for a gorgeous and thicker/warmer design that definitely pays off. I just knitted a beautiful scarf with cables. My first time. I loved it! They are much easier than would be expected, but oh so much fun! I knitted gloves with cables. It’s my favorite accessoire. Glenna, I love the cable pillow. I also think that picture of you and your friend, who would apparently be the same size for a sweater, is a great illustration of how general pattern sizing does not work for everyone. What a stunning pattern! What I love most about working cabled motifs is that they always remind me why I started knitting again. Hat it not been for a certain cabled hat pattern that I fell hopelessly in love with (and absolutely has to replicate) I’m not sure I would have started knitting again. My favorite thing about cables is how difficult and hardworking they look when they’re rather simple…once you get the hang of them. Love the texture they add as well. i love how pretty cable knitting looks. it seems like it would be so complicated, but its not. i also wanted to say thank you for all the sweater knitting talk you’ve been doing. its very helpful and i have bookmarked this series for future reference. What I love about cables is how pretty they look and how easy it is to make them. My favorite thing about cables is that they are so easy to make and look so difficult. You’re whipping out blog posts and finished projects like a mad woman…I’m so jealous. I would love love love to start knitting cables but I haven’t made it that far in my knitting life/adventure. Soon, very soon cables will be mine! 🙂 Right now I’m getting ready for Christmas and knitting everyone I know a pair of podster mittens. They all look different too since everyone has their unique tastes. Great pattern! Thank you! From one curly to another, you are such a cable knitting rock star! Seriously? I love knitting cables through the back loop for the extra pop and enjoy the texture they create in my projects! I would lovew to win copy of Canadian Living. I have enjoyed its articles about knitting and crafts for many years. My favorite thing about cables is the texture they provide. Also, they are so easy to do, but look so complicated! I just found your blog, travelling here from the Yarn Harlot. I’m enjoying it and look forward to your posts. Thanks! Typically I don’t find knit or crochet pillows very interesting or appealing, but this Aran pattern lookd GOOD. 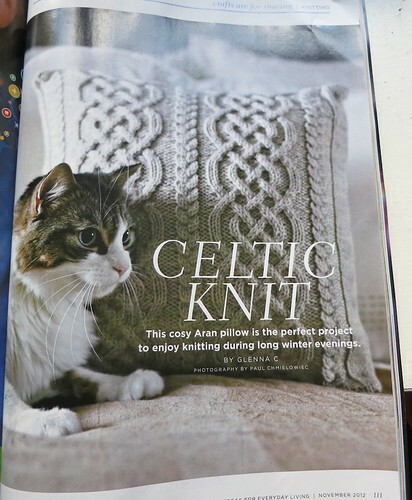 Could it be the non-chalant cat in the photo, or am I finally coming around to home knitting…? I love cables because they look so pretty and complicated, but they’re so easy to do! Beautiful pillow! I’ve always loved the look of cables, and I love knitting them because they add so much interest to all kinds of projects. Thanks for the chance to win! Cables are like knitting magic! Seem hard but aren’t too bad. Non knitters are super impressed by them. Lovely pillow! We all love this, I see! I am told that cables are possible for me, so I would love to win! My favourite thing about knitting cables is that they are fairly easy but everyone thinks you are an expert knitter. The pillow is beautiful! I just really love the way cables look in a FO, so I”m willing to knit them! My favorite thing about knitting cables is that it looks so much harder than it actually is. Looking at a finished cable project is the best self-esteem boost ever. My fave thing about cables? They’re deceptively easy and produce magical results! Non-knitters often look at your work in awe (and the knitter gets a nice ego boost!). Cables give character to knitted garments and make the process of making much more interesting…what isn’t there to love in that!! I love cable knitting, especially now that I’ve learned to cross them without a cable needle (unless they are too wide, that is). I think cables are absolutely magic, watching the knit fabric sculpt into twisted lines and braids! I particularly love Celtic designs and you pillow is fab! Cables are awesome because they add so much easy texture to a design, and they help you keep track of what row number you’re on! Especially when doing different cables with different repeating rows! I think it’s amazing how you can create such beautiful patterns by twisting and crossing stitches. Whoever had the idea to do this had an amazing imagination! I love how unbelievably cool cables look – no matter where they show up – on socks, sweaters, or pillows! I haven’t learned to knit cables yet. I was recently looking for a class in my area to learn. I love this pillow though…gorgeous! I love knitting cables because when I’m done, it seems surreal that I actually “made” such a thing of beauty!!! Cabled items look so difficult and complex, and really are not. I love the rich look they add to any knitting I do….. Awesome pillow! My favourite thing about knitting cables is that people (i.e. non-knitters) think they are so complicated but really they are so easy! Cables are a challenge and they make the finished design look so beautiful! I love cables without a cable needle, especially in a wool that holds the stitches for you while you rearrange them. I believe that in a former life I was Celtic. I know this because All Things Celtic – music, writing, or even the humble cable – summons forth something deep within me. I love knitting cables because they are easy but add so much visual punch to a knitting project. I adore cables. The texture and beauty of those twining patterns add so MUCH to any knitted item. I’m always on the lookout for new and different patterns and designs. It’s funny because my first introduction to cables all those many years ago was in the Aran sweaters and fisherman knits. However, the cables never made me think of netting or wild northern seas, but of forests and trees and vines – still my favorite motifs for decorating. Cables add so much dimension to a knitted piece. The designs are interesting and eye-catching, while add structural integrity to a knitted piece because they pull in so much of the yarn. Love love love them. Love the new pillow pattern. I like cables because they are so classic & timeless! the best thing about cables is that they give so much bang for the buck – relatively easy to do, but look so fantastic and complicated! Love ’em! Very pretty pillow! I love cables for the challenge of them. Especially something intricate like this. I like knitting cables because they aren’t boring. Love knitting cables because they are so easy! The patterns are always easy to follow. I may have this wrong but did you give the name of the orange cable sweater?? Would love to make for my daughter. Hi Sandra – I haven’t given the name of the orange cabled sweater yet because it’s a design of my own about to be finished 😉 But I will certainly release it as soon as I can! cables are like colorwork- you can’t stop! i love cables when you get them just right. they make me feel like the successful knitter that i am! Texture! That’s what I love about cables, plus the variety of designs possible. I recently finished a warp featuring reversible cables, just fascinating to knit. My favorite thing about cables is just their look. If the simplest of cables gives a knitted item so much texture and added interest. As many others have said, I also love cables because other people – both knitters and non-knitters – are so impressed by them! So much attention for so little work/skill. I simply love giving away a cable hat, scarf. i just looks so beautiful and people think it takes forever and it really doesn’t. opps my secret is out. Cables for pillows are such a great idea. So much texture makes them look gorgeous. I would much rather knit cables than darn in all sorts of ends from numerous colour changes. Wow, beautiful pillow (and cat)! I’d love that pattern. I like knitting cables because it keeps things interesting. It’s so fun to see the pattern emerge. I don’t know how to knit cables – so – I guess my favourite thing about them would be to learn how.